The bees look to be occupying six combs. It's too cold for much to be going on in the apiary, but it's perfect for baking. This recipe is one of my favorites, not only because it makes great loaves for sliced bread, but it's versatile enough to shape into épis, or "shafts of wheat." Also called Wheat Stalks, épis make impressive pull-apart rolls, perfect for that holiday dinner you're planning. Don't be intimidated... this is a very easy recipe and it makes delicious honey-flavored bread. The flavor of the honey is assertive in this loaf, so choose your favorite and let it shine. Place the dough in a lightly oiled bowl, cover it, and let it rise for 45"-1 hour. When the dough has doubled in bulk, punch it down, and let rise a second time (45"). If you don't have the time for a second rise, that's okay! Go ahead and pre-shape your épis. Divide the dough into 4 portions. 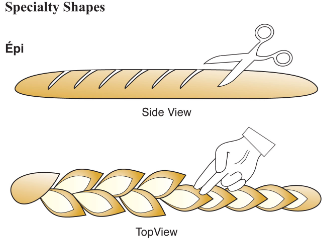 Form each portion into a small baguette. Place on 2 prepared sheet pans and brush with melted butter. Cover and let rise, about 30". Preheat the oven to 375°F now. For a nice artisan look, dust the baguettes with flour. Then, using a pair of scissors, cut the dough deeply but not all the way through to the bottom. Gently nudge each roll immediately after each cut. The illustration makes it look like you do all the cutting first and the nudging after. I guess I should redraw that. It's better to move each roll right away, before the dough reattaches itself. As soon as the épis are formed, slide the pans into the oven. Bake for 30 to 35 minutes. I've learned that I am a terrible food photographer so I don't have any pictures of my épis. If you make this recipe, I'd love to see how your épis turned out. 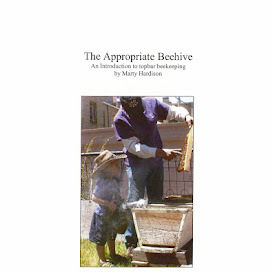 Send your pictures to 303beekeeper(at)gmail(dot)com. HAPPY BAKING! * Remove the filmy layer from the cooked milk. You can use whole, skim or buttermilk. You can even use warm water plus 1/2 cup nonfat dry milk powder. Just don't use plain water, because in this recipe the whole is greater than the sum of its parts. When you combine dairy proteins with those from grains, beans or legumes you create a “complete protein,” one which is just as nutritious as protein from meat. And fiber replaces the fat! **If you are not baking at mile high altitude, you'll have better results using 2 packets of yeast.